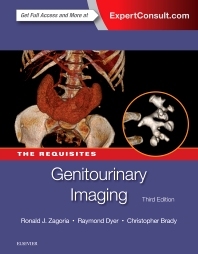 An updated volume in the best-selling Radiology Requisites™ series, Genitourinary Imaging, 3rd Edition presents the essentials of genitourinary radiology by describing the imaging techniques and diseases most commonly encountered in the field. Concise and practical, it familiarizes the reader with the pathology affecting the genitourinary system as well as an approach for detecting abnormalities. Extensive updates throughout reflect the significant changes in the way pathological processes in the genitourinary (GU) tract are imaged since publication of the last edition. Covering everything from basic principles through the latest diagnostic imaging techniques, equipment, and technology, it serves residents as a concise, easily readable text of GU imaging and serves as an update and reference for fellows and practicing radiologists. Practice-proven tips and excellent problem-solving discussions are accompanied by more than 450 high-quality images – nearly 400 all new — all demonstrating a full range of genitourinary radiologic approaches and imaging findings Numerous outlines, boxes, tables, "pearls," and suggested reading lists make reference easy. Numerous outlines, boxes, tables, "pearls," and suggested reading lists make reference easy.